Gov. Crist says the country is "facing the most profound public policy questions"
TALLAHASSEE, Florida (CNN) -- Florida Gov. Charlie Crist announced Tuesday he would not run for re-election next year and instead will seek the seat being vacated by retiring GOP Sen. Mel Martinez. Gov. 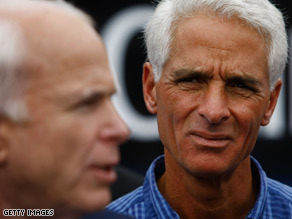 Charlie Crist appeared alongside Sen. John McCain, left, during the 2008 presidential campaign. Crist, who unsuccessfully ran for the Senate in 1998, was immediately endorsed by the Senate Republican campaign arm, which hopes to avoid a bruising primary fight. Former state House Speaker Marco Rubio declared his intention last week to seek the GOP Senate nomination. "Our country is facing the most profound public policy questions in our lifetime -- questions relating to the economy, taxes, healthcare, the environment and national security," Crist said in a statement released by his campaign. "The answers to these questions will have a lasting impact on the country we love and the nation we will leave to our children and grandchildren." He added in the statement: "Here in Florida, we've shown that when we put people first and work together, much can be accomplished, and I intend to bring that same approach to Washington. That is why, after thoughtful consideration with my wife Carole, I have decided to run for the U.S. Senate." A Quinnipiac Poll released last month showed Crist with a commanding 54 percent to 8 percent lead over Rubio in the Republican primary. But the poll also found that more people overall, and Republicans specifically, would rather see Crist run for re-election as governor than seek the Senate seat. Should Crist backers persuade Rubio to abandon his bid, it would help national Republicans focus money and resources on other races in 2010. The GOP needs to win back seats they lost in 2008 to help weaken the Democratic hold on the Senate. Pennsylvania Sen. Arlen Specter's decision to change his political affiliation from Republican to Democrat and the increasing likelihood that Democrat Al Franken will eventually be named the next senator from Minnesota means that President Obama will have enough Democratic votes -- in theory -- for a filibuster-proof majority in the Senate. Last week, the Senate GOP was dealt a setback when former Pennsylvania Gov. Tom Ridge, a popular Republican, decided not to challenge Specter. But news that Crist would enter a Senate race was welcomed by Texas Sen. John Cornyn, who is chairman of the National Republican Senatorial Committee. "While I believe Marco Rubio has a very bright future within the Republican Party, Charlie Crist is the best candidate in 2010 to ensure that we maintain the checks and balances that Floridians deserve in the United States Senate," Cornyn said in a statement. "Governor Crist is a dedicated public servant and a dynamic leader, and the National Republican Senatorial Committee will provide our full support to ensure that he is elected the next United States Senator from Florida." Rubio used a short blast on Twitter to chastise the NRSC for siding with Crist in the primary. "Disappointed GOP senate comm endorses Crist on day 1," Rubio wrote. "Remember that reform must always come from the outside. Status quo won't change itself." GOP Rep. Vern Buchanan, who had been considering a Senate bid, instead said he would run for another term in the House and endorsed Crist. Anticipating his entry into the Senate race, the Democratic Senatorial Campaign Committee last month aired its first television ad of the 2010 elections -- a small buy in the Tallahassee TV market -- that accused Crist of running away from the state's economic problems. Florida Democrats echoed that line of criticism Tuesday shortly after Crist declared his candidacy. "By running for U.S. Senate, Charlie Crist has cut and run on the Sunshine State, once again taking the easy way out, avoiding responsibility and leaving the hard work of facing Florida's problems to the next governor," Florida Democratic Party Chair Karen Thurman said. "At a time when Florida needs real leadership, unfortunately Charlie Crist is running from the mess he created, which is why Floridians are going to send Crist into retirement come Election Day." Still, Crist remains very popular in the state that he has led since he was elected governor in 2006. His approval rating is at 66 percent, according to the Quinnipiac Poll. While it had been speculated for weeks that Crist would run for the Senate, the governor told reporters Tuesday that he made his final decision this past weekend to run for Martinez's seat. With conservatives and centrists battling for control of the Republican Party, the upcoming primary contest in Florida will be closely watched nationally. Crist is considered a centrist, while Rubio is trying to appeal to conservatives in the party. When asked to talk about his primary with Rubio and the future direction of the Republican Party, Crist instead spoke about bipartisanship. "Well, I think what's important to bear in mind is that we do things a little bit differently here in Florida, and that's another reason that I run for the United States Senate," Crist told reporters at a news conference. "We work together to solve problems and do what's right for the people of our state. The people are the boss. And I think regardless of party, we have to work together to get things done. And that's what I'd like to take to Washington, D.C."
Rep. Kendrick Meek, North Miami Mayor Kevin Burns and state Sen. Dan Gelber are all seeking the Democratic Senate nomination. CNN's Kevin Bohn and Deirdre Walsh contributed to this report.